The Inspector-General of Police, Mr. Ibrahim Idris, has filed a libel suit against the Senator representing Bauchi Central Senatorial District, Isah Misau, demanding N5bn as compensation for alleged defamation. 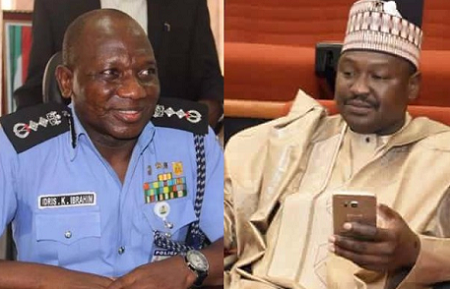 The Federal Government, through the Office of the Attorney General of the Federation, had earlier preferred criminal charges against Misau for allegedly spreading “injurious falsehood” against the IGP and the Nigeria Police Force. Both the civil case filed by the IGP himself and the criminal charges instituted by the AGF office stemmed from allegations of corruption and unethical practices levelled by Misau against the IGP in the electronic and print media. While the civil case has been assigned to Justice Jude Okeke of the High Court of the Federal Capital Territory, Abuja, the criminal case is before the Chief Judge of the court, Justice Ishaq Bello. Justice Okeke has fixed November 13, 2017 for hearing in the case. In the suit filed by his counsel, Marcel Oru, the IGP prayed the court to award cumulative aggravated and exemplary damages of N5bn against the lawmaker. Idris accused the senator of defaming him through publications in Daily Trust Newspaper’s editions of August 10, 22 and 26, 2017; Thisdaylive online publication and Channels Television report. He also prayed for an order directing the senator to tender public apology to be published in conspicuous pages of two widely read national newspapers.